I have some more pictures from the Libris Awards. 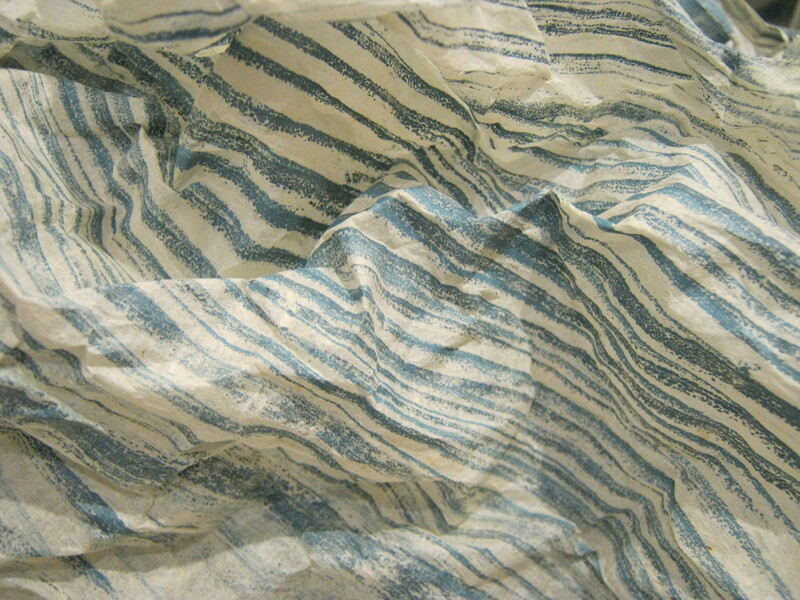 Handmade papers, looking like crumpled and discarded wrappers with digital prints; a statement about profligacy. Approximately A4 , landscape orientation. 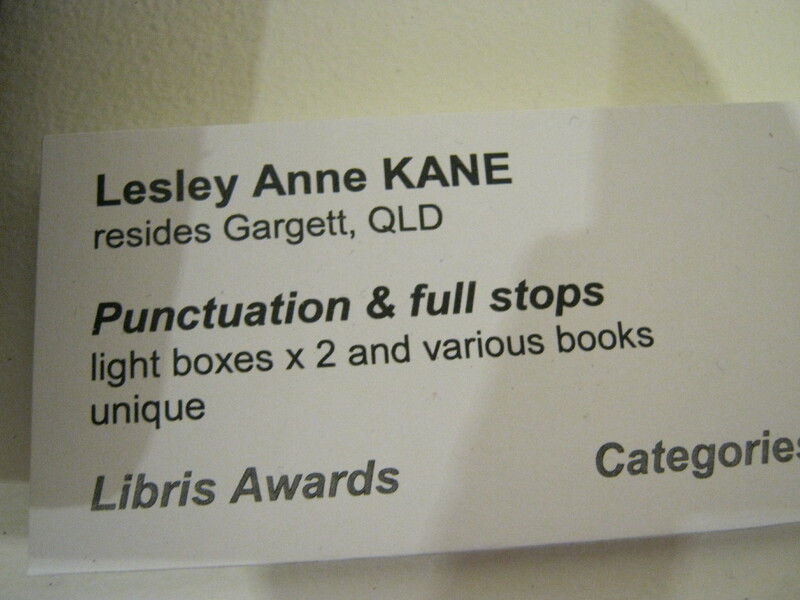 “Punctuation and Full Stops” Lesley Kane. 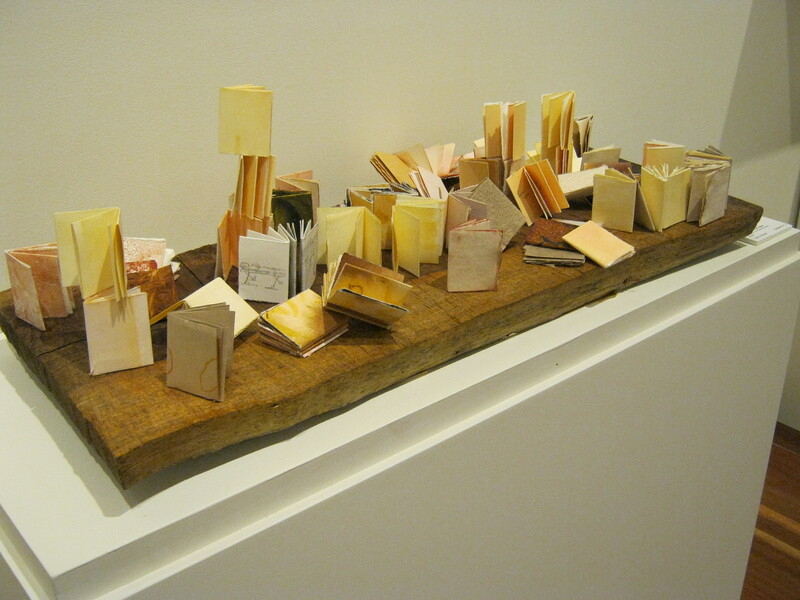 These books are all approximately 4 or 5cms high. Well, yesterday I asked for someone with gloves to turn some pages for me. The request had to be referred to a higher authority, but, after waiting (Papal consultation ,perhaps? ), a staffer appeared with gloves. And most of my photos were of quivering white-clad fingers and shadows! Place your horses back- to- back, one head facing left, the other, right. Now position the jockeys image. And what is this all about? Apparently, an exercise (for management types) in problem-solving. 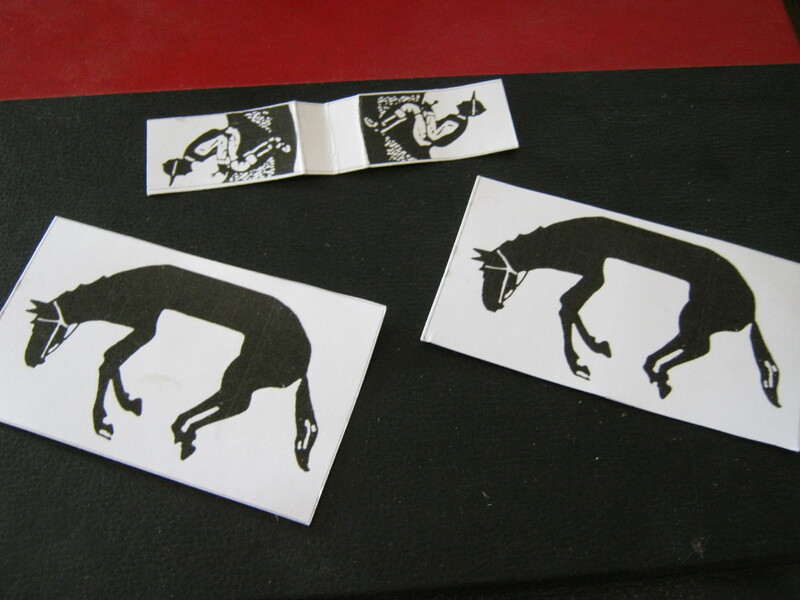 Here is a photo of 3 pieces of card, printed with horse and jockey images. Your task, should you choose to accept it, is to print and cut out the 3 rectangles. That’s 2 horses ( with strange caved-in tummies!) 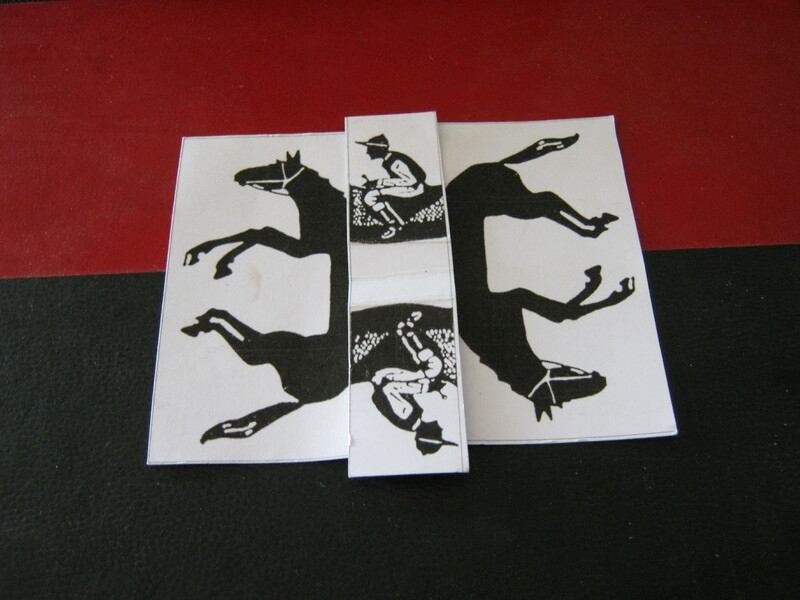 and one strip of card with 2 jockeys. Don’t cut out the images! Yes, I chopped the corners, but it doesn’t matter. I’m pleased to say I’ve finished my books! It’s a bit like the last day of exams, not that I’ve had one of those for a while! So now I can get on with other things.Perhaps clean the windows? Sort out the tattier bits of the garden? Prune a few shrubs before they re-classify themselves as trees? Pack my bag? 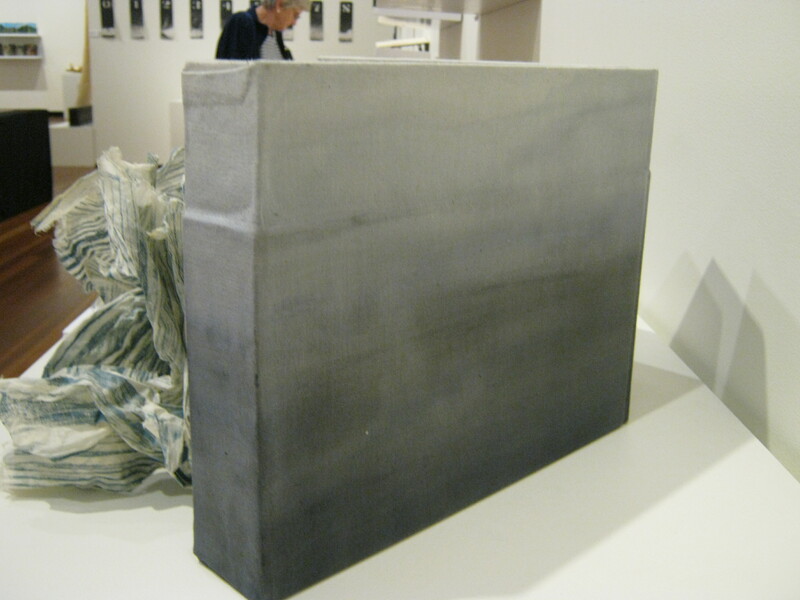 Here are some pretty pictures from the Libris Awards 2013 show. 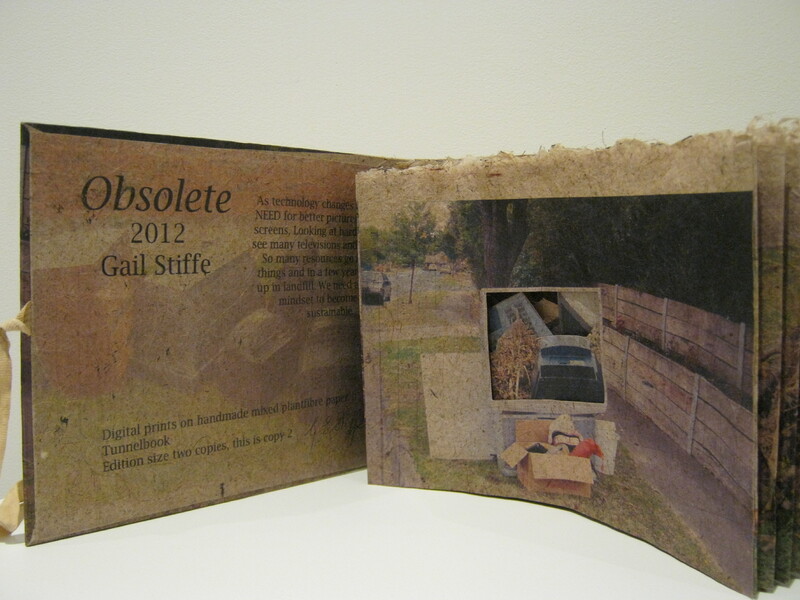 Yes, more artists’ books. 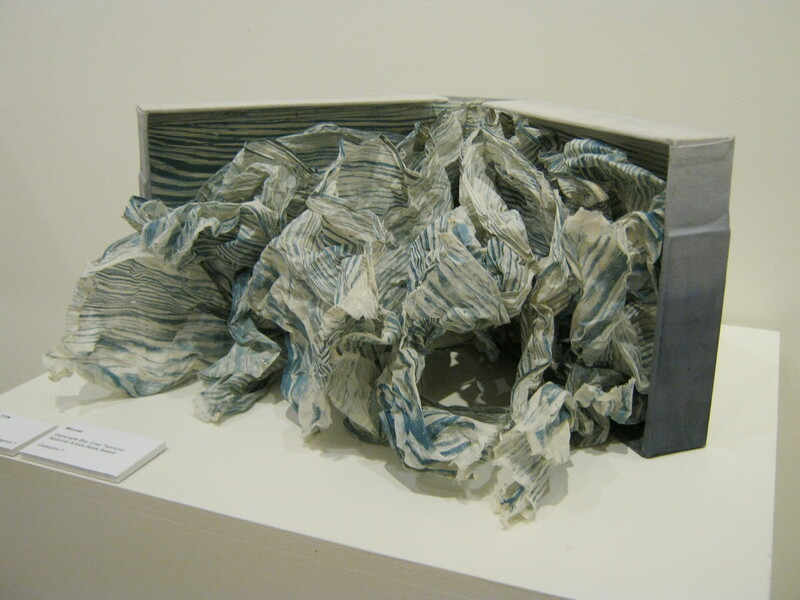 This is the winner, “Wave Form.” Paper, printed from a woodblock, presented in a hinged box. I’ll ask some of my friends if they mind my putting their work on the blog.Probably not, but I try to be polite!